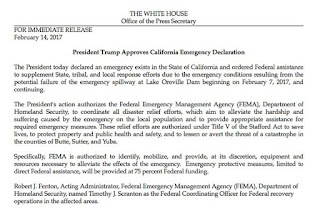 Just hours after the Butte County Sheriff reduced the immediate evacuation order of Oroville region residents to an evacuation warning, President Donald Trump and the Federal Emergency Management Agency (FEMA) today approved both recent gubernatorial requests for federal assistance – one to support the response to the situation at Oroville Dam and the other to help with the impacts of January storms. A press release from the White House said Robert J. Fenton, the Acting Administrator of FEMA, Department of Homeland Security, has named Timothy J. Scranton as the Federal Coordinating Officer for Federal recovery operations in the impacted areas. 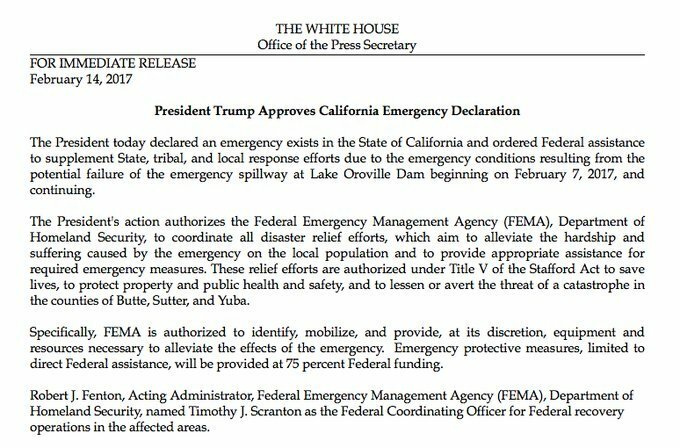 Yesterday, Governor Brown met with emergency response officials and sent a letter to President Donald Trump and FEMA requesting a Presidential Emergency Declaration for Direct Federal Assistance to support the communities impacted by the situation at the Oroville Dam's emergency spillway. “Separately, last Friday, Governor Brown requested a Presidential Major Disaster Declaration for the state to bolster ongoing state and local recovery efforts following January storms that caused additional flooding, mudslides, erosion, power outages and damage to critical infrastructure across California,” according to the Governor’s Office. The Butte County Sheriff’s Office today reduced the immediate evacuation order to an evacuation warning, allowing residents in the region impacted by the order to return to their homes and businesses. On Sunday, February 12, state officials ordered the evacuation of over 188,000 people from Butte, Yuba and Sutter Counties. On the following day, members of the newly-formed Delta Caucus of the California Legislature on February 13 issued a statement regarding the “hazardous situation” at Oroville Dam after The Mercury News reported that previous concerns about the safety of the Dam’s current infrastructure were ignored. They said they have a “duty to ensure California’s existing infrastructure is maintained and upgraded, and not sacrificed in favor of conveyance projects,” referring to Governor Jerry Brown’s plan to build two massive water tunnels under the Sacramento-San Joaquin River Delta, the largest estuary on the West Coast of the Americas. “We are concerned that a clear alarm raised 12 years ago about the state of the Oroville Dam’s emergency spillway was discounted. There has been more than enough time since then for upgrades and maintenance to the structure. Instead, nearly 185,000 people have been displaced, and there are still people in harm’s way. A catastrophic failure at Oroville would result in uncontrolled releases that do considerably more harm to the surrounding communities, and threaten those further downstream, including levee-protected communities in the Sacramento-San Joaquin Delta. For now, we have a collective responsibility to ensure that people are safe and that necessary steps are taken to prevent further compromise of the entire Oroville facility.